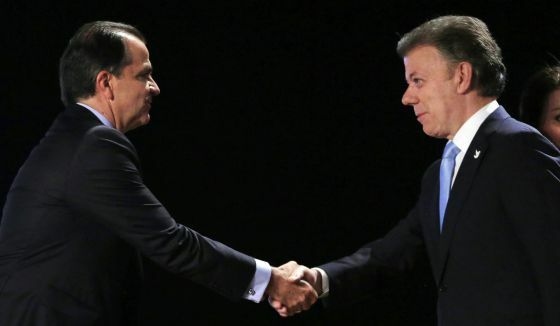 The first round in the Colombian presidential elections brought the two favorites into a run-off that will take place on 15 June 2014. However, it was quite surprising that it was Iván Óscar Zuluaga who gained almost 30% while incumbent Juan Manuel Santos only obtained 25% of the votes. Considering the fact that just half a year ago Zuluaga was basically unknown among Colombians and Santos was able to use all the state machinery in his favor, this first round certainly was a surprise. Now, the run-off will decide between war and peace in Colombia. On a very positive note, the Organization of American States (OAS) praised the elections as free and fair. For sure, the unilateral ceasefire that was announced by the FARC and ELN helped to contribute to an atmosphere without fear, only low levels of violence were reported by the Colombian Conflict Resolution and Analysis Center (CERAC). On a rather negative note, only 40% of Colombians decided to cast their vote which is historically one of the lowest turn-outs ever in Colombian history. At the moment, Zuluaga and Santos try hard to convince the other candidates of the first round to get their approval. Not surprisingly, Martha Lucia Ramirez who came in third with a strong 15% spoke out in favor of Zuluaga – however, many members of Congress from her own Conservative party openly came out in favor of Santos. Thus, the conservative vote most likely will be split between the two remaining candidates. Clara López from the leftist Polo also gained some 15%, a surprisingly positive turnout for her, and she is not all that clear whom to vote for, because both Santos and Zuluaga stand for a neo-liberal economic model which she cannot support. However, the question of peace with the FARC will prevail and the majority of the López voters will be in favor of Santos. Surprisingly weak was the showing of Peñalosa with some 8% of the votes; in April he was predicted to be main challenger of Santos but he could not sustain the momentum. Although Peñalosa was technically the Green candidate and he spoke out in favor of the peace negotiations with the FARC, he had strong connections with former president from the far right, Álvaro Uribe. Thus, the votes received by Peñalosa will most likely be split between Santos and Zuluaga. Overall, it seems to be a very close run-off. As a peace agreement is paramount for Colombia, it is hard to understand why there is not a stronger support for Santos to be seen. Some leading figures of the leftist camp speak out in favor for Santos because the candidate-president wants to achieve peace through dialogue and not through force. However, the average Colombian citizen does not feel any kind of urge or need that a well-negotiated peace agreement with the FARC is of utmost importance to take a huge step in overcoming the 60-years-old internal conflict in Colombia in a sustainable manner. Many Colombians seem to be traumatized from the last peace negotiations under president Andrés Pastrana that ended in a disaster in Caguán in 2002. Instead of peace, the FARC was stronger than ever and more militant than in earlier periods of the conflict. The brutal methods used by the guerilla – that at that point was a standing army – led to a widespread mistrust of Colombians. This feeling turned into hatred during the eight years of Uribe. This most influential man was able to use the media, particularly TV, in his favor to spread pure hate every day against the FARC while the massacres of paramilitaries or the Colombian army itself against civilians were hardly reported or not at all. Today, Uribe is seen by many Colombians as a “pacifier” and the one who turned Colombia into an “economic tiger.” It is largely neglected which impact Uribe’s policies of “democratic security” had on millions of Colombians that had to suffer gross human rights violations. Although many Colombians do want to see their country in peace, there is also the fear that Santos is “selling” the Colombian interests and helps to strengthen the FARC which are portrayed terrorists (and listed as such by the U.S. and the EU). From the outside it is very hard to understand that because Santos’ government continued to fight the FARC with an iron fist – even during the time of the peace negotiations on Cuba. However, reality and perception is widely distorted and Santos was not able to explain to Colombians what is at stake with these negotiations and what is actually happening. Interestingly though, Zuluaga changed positions during the week after the first round of presidential elections. In a complete U-turn of his position, Zuluaga announced that he would be in favor of talks with the FARC. While it is true that he never categorically denied the stop of negotiations with the FARC, he actually demands so much that it is basically unrealistic that the FARC can agree to it. Zuluaga takes a risk here because one of his strongest points of his campaigns so far was to undermine the peace process in Havana. 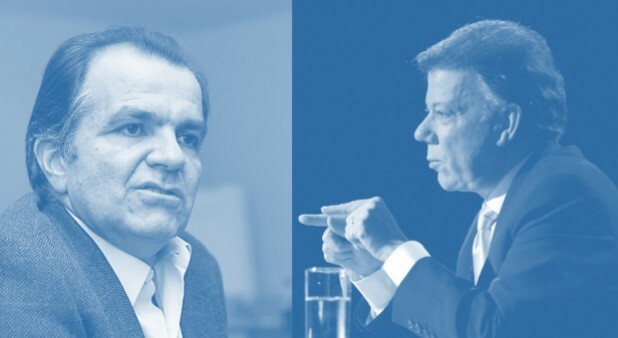 Often Zuluaga said that Santos would have turned into a supporter of Castro and Chaves (castro-chavismo) because he negotiates with the FARC. It would be better to fight the FARC until its bitter end – with the implication that this would be done whatever the cost of lives of civilians and human rights. Now, Zuluaga tries to play soft like a wolf in a sheep’s clothing. However, his words to continue the peace process simply cannot be taken seriously considering what is demanded by his campaign that would need to be changed. In short, the FARC would not be able to accept Zuluaga’s demands that do not seem to be sincere in the first place. The importance of a negotiated agreement with the FARC would be that crucial questions like land or drugs could be fixed that could transform the country to a fairer society. Surely, the reality might prove otherwise and there are still other illegal armed actors in Colombia active. And yet, an agreement is the way forward. Although Santos has a strong economic record, he was not able to reach Colombians and his campaign was riddled with problems. In addition, he tries to please everybody and ends up pleasing nobody because he appears to lack any principles. In short, Santos is a pure pragmatist lacking any ideology. Thus, a journalist from The Guardian compared the Colombian president with former UK prime minister Tony Blair – with the small difference that Santos is lacking any kind of charisma. Thus, Santos is so close as nobody before him to bring the armed conflict with the FARC to an end – and yet he hardly is rewarded at the polls. According to the polls casted so far, it will be a very tight race and shows the two candidates are virtually tied. The run-off on 15 June is a decision between peace and war. Zuluaga is very much a hardliner and as he is very much reliant on the support of Uribe, it is clear that with him the talks on Cuba would be suspended – whatever he announces now about his wish about a possible continuation of peace talks. Although there is no guarantee that there is success in the negotiations when Santos remains president, the likelihood of a negotiated agreement is probably as high as never beforehand in recent decades. While many Colombians do not seem to see the importance of the vote as of yet, it will be indeed a historic vote about Colombia’s future. Thanks for the clear and concise overview and analysis of the positions! I’ve been following the Colombian elections and we discuss them often in my office, but it’s difficult to devote much time to doing any sort of in-depth reading – so this was a great primer! I think you forgot a tiny little detail… Santos was the Minister of Defence from Uribe’s government.